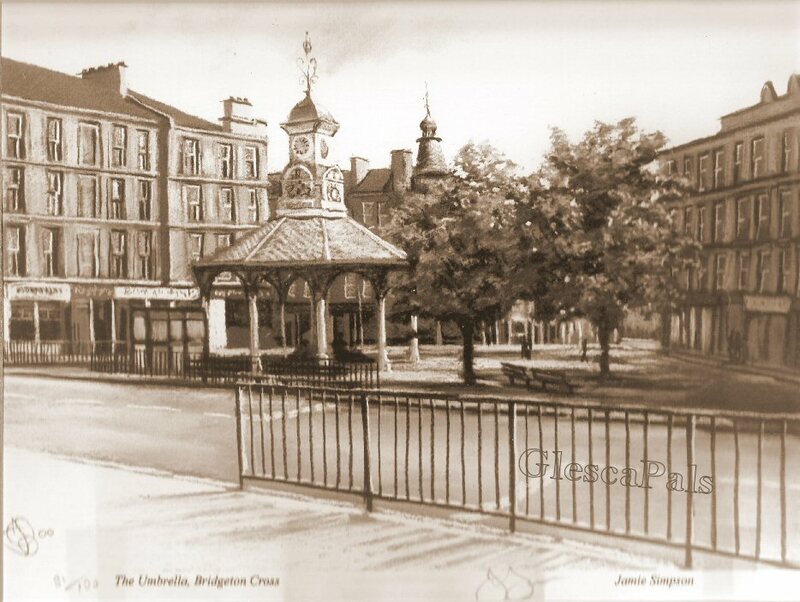 "Popped up tae visit ma Maw, and she haunded me this painting of a tram in Bridgeton Cross, circa 1960, by someone cawed H Watson. Anyone got a clue as to who he/she might be?" The originals are on whit Aah kin only describe as "Art" paper, and are starting tae discolour a wee bit. As my daytime hat is wan of Photographer, Aah huv contacts with a couple of specialist labs, and will be having a few copies made so that my brothers and sister can each huv a perr tae hing oan their wa's tae remind them o therr roots. That's therr Christmas soarted!! They shud print up nicely oan a 16" x 24" canvas.
" Webmaister I don’t know if you are aware of this, but H Watson’s painting c1960 has an open-topped tram and an ornamental lamp standard at the corner to the left of the tram. Note also, John Lappin’s painting 1947 also has an open-topped tram.